We anticipate the Prius V will be in high demand initially, but Prius buyers tend to load on the luxury features, because they can afford to--so if you're looking for economical family transport that gets great gas mileage, go for the base-level Prius V Two, if you can find one. The 2012 Toyota V wagon offers all the classic Prius hybrid virtues--low-speed electric running, top-of-class fuel economy, and interior space--in a super-sized package that still offers remarkable gas mileage ratings. We think it will do very well among Prius owners with families who need the extra space for people and stuff. The 2012 Toyota Prius V wagon is the first of several additions to the Prius line, which since 2004 has been only a five-door hatchback. It takes the basic Prius formula of a practical vehicle with a liftgate and expands it in every direction, while retaining the Prius hybrid drivetrain. And it's rated at 42 mpg combined gas mileage by the EPA, meaning it's by far the most economical family vehicle on the market. The Prius V wagon may also have four doors and a liftgate, but while there's no mistaking it for anything other than a Prius hybrid, every body panel is different from the hatchback. The rear end has been squared up, but from certain angles it still looks like a tall hatchback rather than a boxy-ended wagon. Inside, Toyota dispensed with the striking by impractical "flying buttress" console and replaced it with a more traditional center bin/elbow rest and a center stack that gives easy access to trays, cupholders, and everything else on the tunnel. The dashboard resembles a standard Prius too, with the high-level central display offering a scattershot array of diagrams, readings, icons, and symbols in full color. 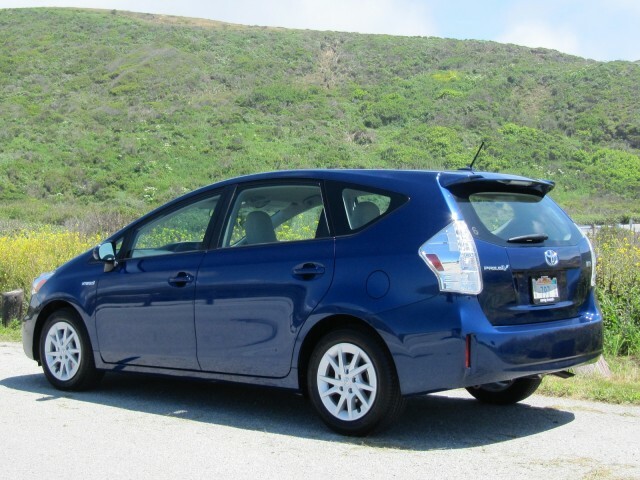 The 2012 Toyota Prius V isn't notably different to drive than its smaller sibling. 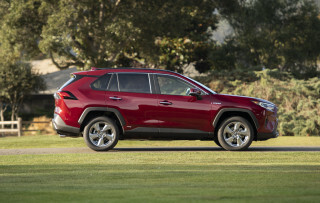 The driver sits somewhat higher, but hardly at the commanding heights of a sport-utility or truck. While it's larger in every dimension--especially wheelbase and overall length--it provides the same Prius experience behind the wheel. Its 98-horsepower, 1.8-liter engine and pair of electric motor-generators will feel very familiar to existing hybrid drivers, and somewhat removed and vague but perfectly fine to Prius newbies. The Prius V is about 300 pounds heftier than the hatchback, so it's a tad slower and consumes more fuel to push its larger self through space. But it's the interior volume that makes the difference. According to the EPA, the Prius V has 34.3 cubic feet of cargo volume with the rear seat--it slides, so that's in its rearmost position--and 40.2 cubic feet with it slid forward. With seats folded, the the cargo volume rises to 67.3 cubic feet. Equally as important, the width between the wheel wells is 39 inches, making the flat load floor wide as well as long. The Prius V should do well on its safety ratings, with seven airbags and all the required electronic control systems. 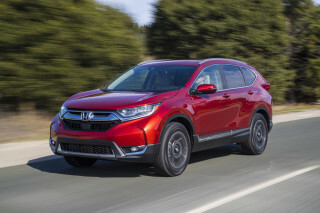 It has not yet been crash-tested by the National Highway Traffic Safety Administration (NHTSA), but the Insurance Institute for Highway Safety (IIHS) gave it ratings of "Good" (its highest) for frontal offset and side-impact crash tests, roof crush strength, and rear crash protection. Standard equipment for this practical family vehicle includes fabric trimmed seats, automatic climate control, and a tilting and telescoping steering wheel. To Toyota's credit, its rear seat not only folds down and splits 60/40, but also slides fore and aft and reclines from 15 to 40 degrees--a rarity in wagons. The new 2012 Prius wagon is offered in three trim levels, confusingly known as Prius V Two, Prius V Three, and Prius V Five. The Two is the base model, and the Three adds a tilting-and-telescoping steering wheel with audio, Bluetooth, and climate controls in the steering wheel, plus voice-activated navigation controls. It also includes Toyota's Entune cloud-based infotainment system, and a navigation display and audio unit with a central 6.1-inch screen. Finally, the top-of-the-line Prius V Five adds a six-way adjustable driver's seat with adjustable lumbar support, and a four-way adjustable front passenger seat, both of them heated and trimmed in SofTex fabric (lighter than leather), as well as 17-inch, 10-spoke alloy wheels, a smart-key system, LED head lamps, and integrated fog lamps. Only the Prius V Five can be fitted with the Advanced Technology Package, which includes an HDD navigation system, a panoramic view moonroof with electrically powered sunshades, and dynamic radar cruise control. One year's worth of the Safety Connect system is also thrown in, giving drivers roadside and emergency assistance, automatic notification of emergency services in the event of a collision, and a stolen-vehicle location function. 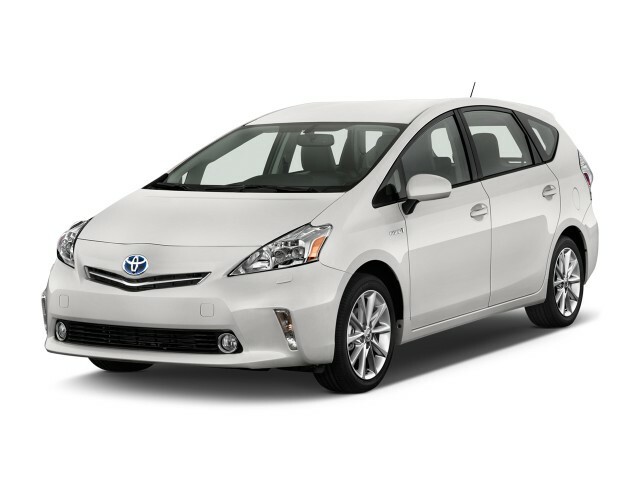 Economical, Reliable, Versatile -- Prius is still of the BEST BUYS in automobiles, anywhere! 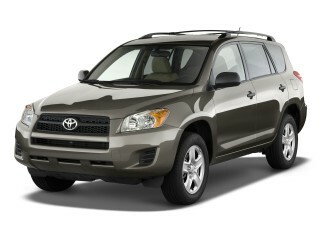 This/my seventh Toyota provides excellent value for money and versatility. 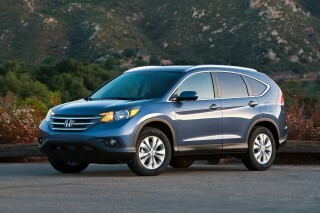 Fuel economy is this car's best competitive advantage, and I love the Michelin 4-season tires. Wish it had come with a roof rack, and that I'd waited another 6-8 months to purchase the plug-in version. The Prius V is a Hybrid with ample room for passengers and cargo. Looking for a different year of the Toyota Prius V?